Colorado's Rocky Mountain National Park is a treasure of mountain views, plunging canyons and endless alpine meadows full of wildflowers. Millions of visitors come to the park every summer to hike, fish, go rafting and take beautiful photos. Pack your sense of adventure, because you'll find an almost endless list of things to do in Rocky Mountain National Park in the summer. 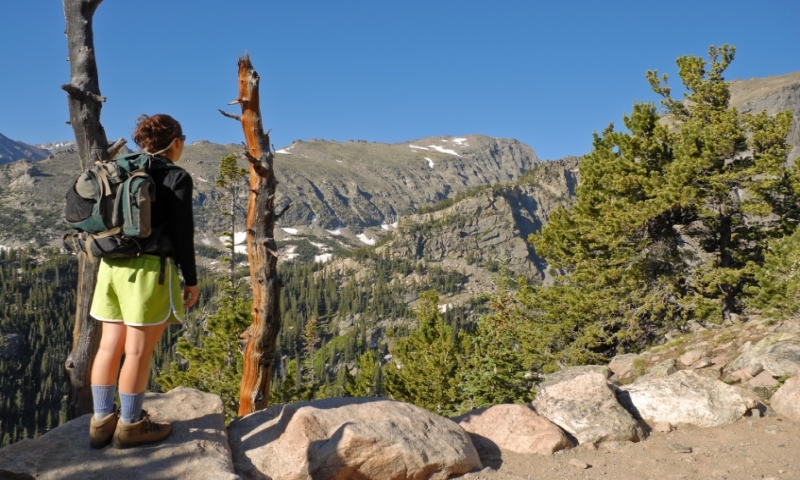 There are dozens of great hikes throughout the park, suitable for everyone from toddlers to experienced hikers. Families with small children can head around Lily Lake, which is an easy half-mile walk around part of the lake with views of Mount Meeker and Longs Peak. Experienced hikers may want to make the full-day hike to the Devil's Thumb Pass, ascending more than 3,000 feet to the top of the pass. The view is incredible, especially in July and August when the wildflowers are in full bloom. There's a parking area at the bottom of the trailhead off Hessie Road. The Cache la Poudre River cuts through the heart of Poudre Canyon in the northern section of Rocky Mountain National Park, and it offers some of the area's best whitewater rafting. Mountain Whitewater Descents can arrange half-day, full-day or even a two-day overnight trips down the Poudre. With just a half day, you can expect to see class IV rapids like "Tunnel" and "Pine View Falls." Rocky Mountain National Park is the perfect place to let loose your inner cowboy/cowgirl and hit the trails on horseback. With Estes Park Outfitters, you can explore the historic Homestead Meadows, high in the Rockies, on a guided ride limited to just four people. It's a unique chance to ride side by side and enjoy the silence of the forest and mountains as they once were. You can also choose one of two locations with SK Horses, which offers guided rides ranging from an hour to a full day. They even offer ponies just for the kids. Every August, the Estes Park Heritage Festival offers some of the best of a century of Western history and festivals in the town of Estes Park, which is in the heart of Rocky Mountain National Park. There are gunslingers, craft stalls, lots to eat and live music all weekend long. There are also carriage and wagon rides and a petting zoo, where kids can feed the goats. All summer long, the Rocky Mountain Nature Association gives weekly birding classes in the field about all the birds that make their homes in the Rocky Mountain National Park. One of the park's naturalists will teach you how to identify bird songs and calls, and they will also provide a great deal of information about nesting, migration and habitat. The Rocky Mountain Nature Association offers a wide variety of other summer lectures and seminars as well, covering fascinating aspects of the park, its history and ecology. Families can sign up for a morning treasure hunt, where they will use a GPS unit to explore the River Walk and Lake Estes. You can also sign up to learn more about local wildflowers, native traditions, and you can pick up some new wildlife and nature photography tips. What's a visit to the mountains without a rodeo? The July Rooftop Rodeo in the park is as western as it gets. Held at the Stanley Park Fairgrounds, the rodeo showcases steer wrestling, calf roping, bull riding and even mutton busting. There's also an old-fashioned rodeo parade down Elkhorn Avenue in Estes Park, complete with floats and a rodeo queen. In Rocky Mountain National Park, the summer winds down with a traditional celebration of all things Scottish and Irish at the Estes Park Fairgrounds. The Longs Peak Scottish Irish Festival is all about traditional competitions, and that means caber tossing, hammer throwing and stone putting. There are also jousting competitions, step dancing competitions, highland flings and bagpipes. For the past nine years, the village of Estes Park has staged a memorial concert to celebrate the spirit of John Denver and his down-home brand of music. Local musicians play all the John Denver songs that you know and love, which were inspired by the beauty of this mountain range, this park and this state—all outdoors and surrounded by the natural beauty. The final event of the summer in Rocky Mountain National Park is the Estes Park Film Festival. The event began in 2006, and from inception, it has kept its focus on international indie films. The films are shown at the Historic Park Theater in Estes Park, and they draw filmmakers from around the world. There are plenty of parties in town to enjoy yourself, as well as seminars if you feel like picking up a few tips. Unfortunately there will not be a 2012 Estes Park Film Festival. The festival will re-launch in May 2013 to coincide with the Historic Park Theatre's 100th Anniversary. About HomeAway: For a great selection of Rocky Mountain National Park Lodging options, check out HomeAway's large assortment. Choose Pagosa Spring or Estes Park Cabins, Grand Lake Colorado rentals and many more. Meet the Author: Kiley works and writes from Denver and has been editing and writing travel articles and guides for the past five years. She and her husband have three kids, proudly call themselves “Colorado Natives” and love road trips exploring the Rocky Mountains and the West.